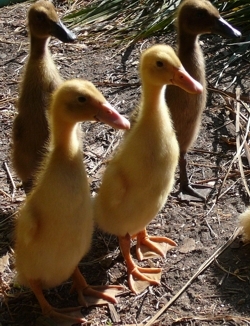 A duck’s quacking ‘chatter’ is its vocal expression of emotion. Having been around them for years, I can pick out their moods: excited, content, curious, afraid, hungry, feeling kinship. They are Indian Runners, an extremely social breed. I’ve come across large segments of humanity that can’t countenance such ‘humanizing’ of animals in general, and birds or less creatures in particular. Of course, they wouldn’t be reading this book anyway, so I won’t need to justify my view… at least so far. I realized today, in a simple earthy way, that human thought is the equivalent expression of emotion for us. That includes any speech or writing that thought produces. 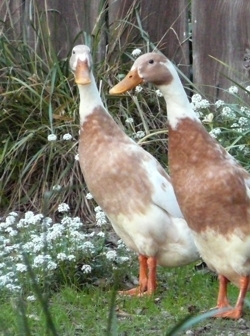 Ducks quack their emotion, dogs bark their emotion, and humans think and speak their emotion — and so on throughout the animal kingdom. The one thing that stirs up emotion more than anything is apprehension of the unknown or unsettling situations. When a hawk flies through the area, the black birds go nuts, and this sets off some real commotion among the ducks. I doubt they know it’s a hawk, they just sense something is wrong. The unknown has reared its awesome head. Conversely, in the typical morning stillness with the world feeling ‘known’ the ducks waddle about quietly in their moment-to-moment. Seeing a direct connection between emotion, thinking, and speaking offers a straightforward way to understand what chapter 56 means when it says, One who knows does not speak; one who speaks does not know. (1) A sense of the ‘unknown’ shakes emotional equilibrium more than anything else. Feeling the unknown drives us to think and speak, and ducks to quack. The dialectic nature of human cognition creates a vast virtual known and unknown — the mind. The, “one who speaks does not know” does not refer to a lack of knowing something; it refers to sensing the void — nothing. It invokes the unknown, that flowing river of “does not know”, which our mind then fills with thoughts and speech. Conversely, emotion relaxes, when, as chapter 16 says, I do my utmost to attain emptiness; I hold firmly to stillness. The myriad creatures all rise together and I watch their return. The teaming creatures all return to their separate roots. 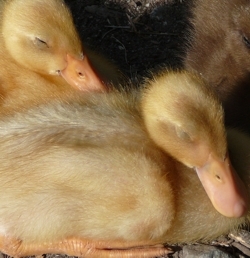 Here, there is no emotional energy to drive quacking, thinking or speaking. Here, not even the unknown is known, as it were. Then I can just be a quiet duck. (1) Chapter 56 says, “One who speaks does not know”. This is not some admonition like, “Verily I say, ye shall not think, speak or quack”. In other words, the thinking, speaking and quacking are symptoms, not causes. Conversely, trusting your thoughts to be true establishes thought as fundamental in its own right instead of simply a symptom of a deeper reality. Trusting what you think to be true leads to difficulty, as chapter 71 cautions, Not to know yet to think that one knows will lead to difficulty. For a long time I assumed chapter 56 was saying that speaking and thinking were a fault somehow, perhaps because it implied not knowing. Fortunately, the light turns on eventually. Yes, i can see that. We are always trying to find ground and that’s the cause of suffering. There is no ground. I have been posting in the friends of bill w. Facebook forum and I am happy to say, no one understands a word I say. And I owe it all to you. You mean he who knows the unknown does not quack. Am I understanding? Probably, although being a toaist means I’m a fence-sitter in the end. It could just as easily be the other way around. It’s enough to drive one crazy… or smile. This is big! You mean he who knows the unknown does not quack. Am I understanding? It makes so much sense to me that emotion drives thinking and speaking. You must see Eddie the dog when I am feeding)him. He is jumping and barking the whole time and nothing I do can stop it. And you should have seen me at the artists’s reception….I couldn’t shut up. Of course words can stir emotion too. No wonder I like to be alone.